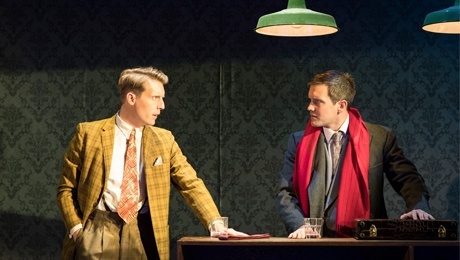 Based on the novel by Patricia Highsmith, this stage adaptation by Craig Warner of Strangers On A Train embarks on a UK tour in a production that is regrettably lacking. Highsmith's thriller (famously adapted into a film directed by Hitchcock) depicts two strangers, Guy Haines and Charles Bruno, who randomly meet on a train where Charles proposes the idea that each murder an obstructive figure in the other's life. What follows details obsession, guilt and desperation as both come to terms with the events undertaken. Whilst the concept holds much potential it is primarily in the execution, rather than the writing, that the production falls flat. Director Anthony Banks' approach is melodramatic, his staging often static and the tone he creates is rather arbitrary and irregular which, ultimately, negates the positives - including the homosexual undertones - of Warner's writing which itself could do with some tightening. Banks also needs to address the pacing issues which dog the production and render it sluggish and tension-less; with greater variety in staging and a brighter pace, the play could certainly be of more interest to watch. Banks' staging is aided somewhat by a set by David Woodhead which - in principle at least, if not implementation - creates interesting theatrical environments within which the characters can live, though transitions still remain which could be contracted, even as the set morphs from one scene to the next. The design is further enhanced by Howard Hudson's lighting and the projections of Duncan McLean. The actors render the roles melodramatically, though rarely at the same level, and this unevenness is jarring. Most successful are John Middleton (formerly of "Emmerdale") as private detective 'Arthur Gerard' and the 'Elsie Bruno' of Helen Anderson with each more attuned in traversing the fine high-wire that is melodrama. Jack Ashton as 'Guy Haines' ultimately fares well but, fundamentally, the cast are hampered by the overly heightened tone of the production and many occasionally cross the line, unfortunately, into farce. Were the production directed in a more authentic, realistic mood then the results could have been far superior but, as it is, the cast attempt to make the best of their direction to varying degrees of success. Strangers On A Train is something of a missed opportunity with a promising - if wordy - script impeded by a misjudged conception uneven in tone and pace and is a story worthy of better.